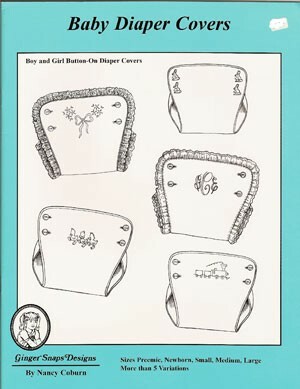 Delightful booklet with 5 diaper cover variations sized Preemie - Large. Button-on diaper covers for boys and girls. Heirloom version with lace, hand or machine embroidery embellishment, decorative button embellishment or monogramed initials. Easy to make and easy to follow instructions.